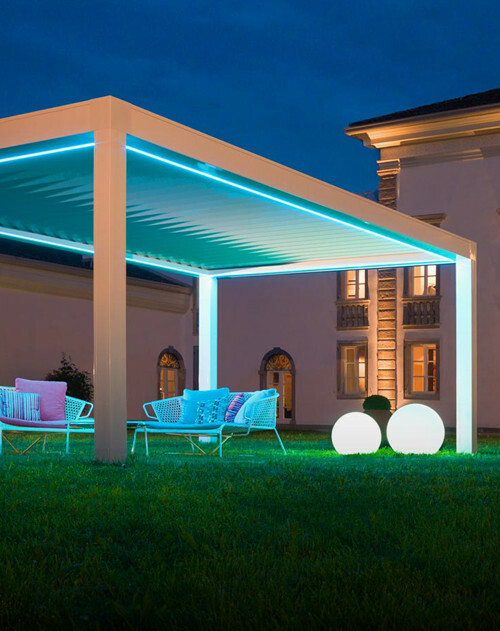 Established in 1960, Pratic is now a land-mark in the design and production of sunshades, pergolas and outdoor structures. In half a century of history it has transformed the way we think of homes and outdoor spaces, revolutionising the idea of open air living with innovations,patents and total quality. Pratic introduces a concept of “made in Italy” with strong local roots, because all the company’s ideas and solutions originate in Fagagna, in the Pratic Concept laboratory of ideas, on the basis of the criteria of technology, innovation and excellence in materials.Criteria that are now combined with environmental sustainability, a goal pursued in the construction of the company’s new headquarters created with energy exclusively from renewable sources.The company now has 140 employees and operates under the direction of Dino and Edi Orioli.